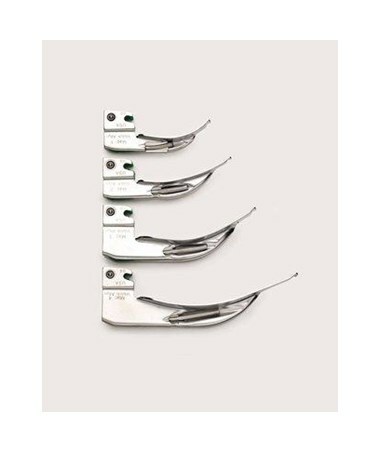 Dr. MacIntosh in 1943 originated a new blade design that forever impacted the field of anesthesiology.Currently the most popular of all curved-blade styles, the MacIntosh blade has survived virtually unchanged since its conception. The earlier blades helped to inspire the MacIntosh blade, a design that incorporates a gentle, continuous curve from the tip to the proximal end. The curve is compressed into the vallecula and the blade lifted, indirectly raising the epiglottis. results in a lower profile that assists in intubating patients with limited oral access. 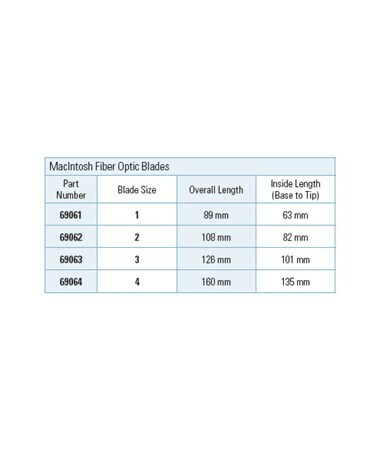 The Fiber Optic Macintosh blades are available in sizes # 1, 2, 3, 4. Welch Allyn’s laryngoscope design uses a single piece of 304-series stainless steel as its load-bearing member.This one-piece construction of the Welch Allyn blade is more robust than the typical competitive product.Furthermore, its one-piece blade construction eliminates the potentially weaker soldered or brazed joint. Welch Allyn’s innovative design incorporates an easy-to-remove light pipe that eliminates the difficult-to clean areas of most competitive laryngoscopes. Another feature designed to help improve the cleaning of a Welch Allyn blade is its surface finish. Typical laryngoscope finishes have a surface roughness of 32Î¼ in. The surface finish used on all Welch Allyn blades has a roughness of just 8Î¼ in. This creates a surface texture that is approximately four times smoother than competitive blades, resulting in an easier-to-clean, stain-resistant laryngoscope blade. What’s more, the surface finish is not a plating, and therefore does not alter the 304-series stainless steel construction of the blade itself. The Welch Allyn Halogen HPX™ lamp is the latest technology in gas-filled lamps. The lamp is more than 30% brighter and whiter than standard halogen lamps. There are primarily two causes of reduced light transmission in fiber optic laryngoscopes: fiber optic breakage and epoxy blockage. Light degradation caused by fiber optic breakage will occur in varying degrees in any laryngoscope that is subjected to severe changes in temperature. When a fiber optic laryngoscope is steam-sterilized, the heat involved causes the epoxy (used to hold the fibers in place within the fiber optic bundle) to expand and extrude past the end of the light pipe. The epoxy cools following the autoclave process and hardens over the optics, blocking light emissions from those fibers. As more and more fibers are blocked, less and less light is emitted and the accuracy of the intubation process may be jeopardized. Welch Allyn’s state-of-the-art blade design allows for the removable fiber optic light pipe to be repolished throughout the life of the blade. When the optics are repolished, occluding epoxy is removed from the input and output points of the fiber optic pipe. This restores the light transmission to its optimum level, thus increasing the overall life of the blade. A Welch Allyn light pipe can be repolished three times over its lifetime—and can then be replaced at a fraction of the cost of a complete blade. Welch Allyn will provide this repolishing service free of cost whenever it is needed over the life of the laryngoscope blades. The removable fiber optic design truly makes Welch Allyn blades the smart choice for you. That’s because this unique design makes our blades the most affordable way to upgrade from standard to fiber optic lighting—while still offering the benefits of one-piece blade construction. To upgrade to fiber optics, simply replace your current, standard lamp light pipe with the fiber optic pipe. Welch Allyn fiber optic light pipes for laryngoscopes are guaranteed for five years against complete loss of performance. Therefore, during the first five years, Welch Allyn will polish or replace the fiber optic light pipe, free of charge, if performance is reduced due to repeated sterilization by steam autoclave. 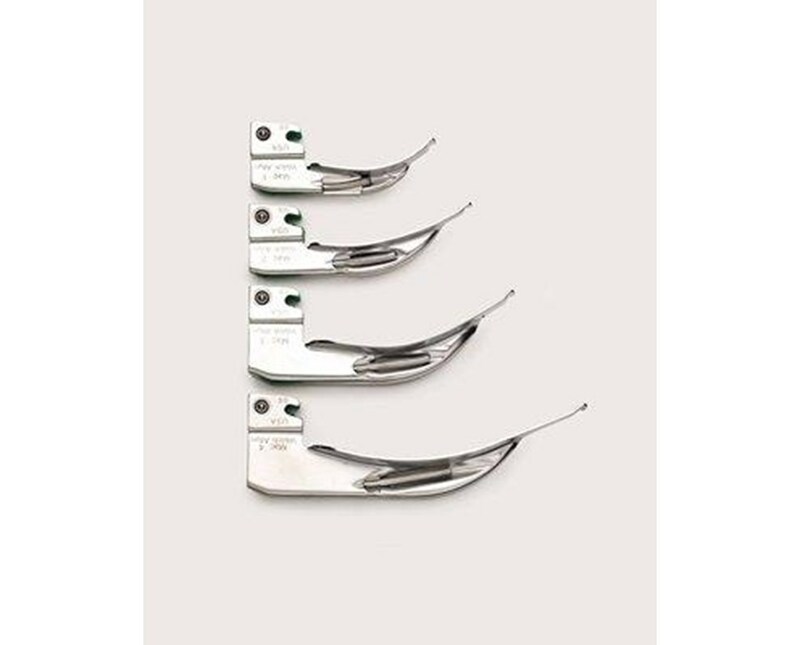 Welch Allyn laryngoscope blades and handles are guaranteed against all manufacturing defects for the life of the instrument. Welch Allyn will repair or replace, free of charge, any parts of its own manufacture proven to be defective through causes other than misuse, neglect, damage in shipment or normal wear. Every Welch Allyn laryngoscope blade comes with a lifetime warranty against manufacturing defects. Reduced handle and blade weight for improved balance and maneuverability facilitates even the most difficult intubations. Blades easily convert from lamp to fiber optic illumination. Makes upgrading economical. Replace deteriorating light pathways for a fraction of the cost of a replacement blade. Reduced proximal blade height assists in intubating patients with limited oral access. Single piece stainless steel blade ensures blade integrity (no soldered joints). Our fiber optic blades feature Halogen HPX lamps for true tissue color and consistent, long-lasting illumination.